Since 2004 we have continued to refine our process and build key partnerships. 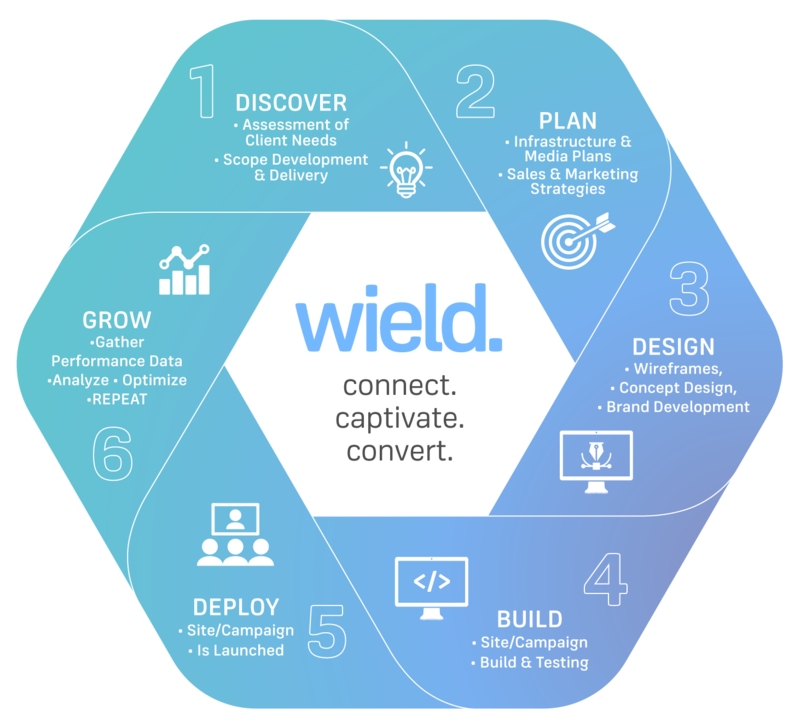 The Wield SERVICE STACK is our strategy-driven approach that continues to produce market-leading brands and web properties that deliver measurable results for our clients. Our expertise and partnerships with a wide range of content management (CMS), ecommerce platforms, and other frameworks allow us to efficiently determine and implement the best solutions to meet to our clients' needs. We have established relationships with key technology partners equipping us with a range of carefully cultivated resources to provide best-in-class applications. The importance of strategy cannot be overstated—it is the foundation of any challenge we pursue and tackle. Every idea and resulting approach is vetted with thorough exploration and analysis, then paired with the appropriate technology, creative, and advertising mediums. Our perserverance and attention to detail produce market-leading brands that connect, captivate, and convert. We manage all the moving pieces of your digital brand strategy, allowing you to focus on running your business. Though we may never know your business as intimately as you, we'll never stop learning. We are passionate about what we do and dedicated to helping your brand thrive within this ever-expanding media landscape. “Like most small businesses, we need to harness the power of online marketing to grow. However, my partners and I don't have the time to master numerous online strategies. Neither do we have the budget to hire our own IT department. That's why we are so glad we've found Wield. They specialize in helping each small business find its own private gold mine of traffic and revenue online. Here's how they did it for us. First, they took the necessary time to understand our business. They also profiled our best customers so they could find lots more of them online. We love their approach of testing small and inexpensively until they refine the right strategy to bring us a dependable stream, and then a river, of new and well-qualified customers. Once they identify a winning strategy, they scale it up methodically and carefully, with a watchful eye on our marketing ROI. They make everything transparent in crystal-clear reports that show exactly what they are doing, where our new customers are coming from, their cost of acquisition, conversion rate, and repeat sales revenue. This means that the funds we invest in marketing are not shots in the dark but profitable investments with measurable ROI. As a result of all this, we are experiencing outstanding and consistent sales growth we could not have achieved without Wield. They are honest, reliable, down-to-earth, easy to work with, totally professional, and really smart. They are a core factor behind our company's rapid and relentless growth. In our small business, we prefer to invest our time doing what we do best and delegating the rest to good people. This is why Wield has become our go-to partner for online marketing. The master plan for a competitive brand. Wield excels in collaboration—working together with our clients in an enjoyable and rewarding approach that delivers strong results. Our work within dozens of verticals has provided us with a wide range of industry insight and experience that directly benefits your business. From day one—we immerse ourselves in your current business model, business plan, and specific industry. Wield strategies balance market exploration and data analysis with the appropriate technology, creative, and advertising mediums to position your brand within your market. Don't be everywhere. Be everywhere that matters. Refine your mission. Define your brand. Defining the personality of your brand is the crucial first step in differentiating your business from your competition. A thoughtfully crafted and purpose-driven brand identity ensures consistent messaging and style across all channels and marketing efforts—forming the foundation on which consumer trust and loyalty is conceived. Your brand identity is comprised of your company’s unique vision, position, voice, look and tone. Working together, we’ll develop a brand identity that firmly positions your company within the constant flux of today’s digital market space. Captivating user experiences with deliberate user interface design. By establishing an understanding of the needs and behaviors of today’s consumer we design user experiences that guide the consumer through your sales process and on to your point of conversion. Wield has expertise in a wide range of content management (CMS), ecommerce platforms, and other frameworks including Wordpress, Shopify, Nexternal Solutions, Woocommerce, and more. For more complex requirements, we build custom web applications from the ground up to solve the specific business challenges of your brand. Smart story-telling for today’s digital consumer. Design is more than aesthetics. At Wield, we embrace the tenet form follows function. The final product—whether it’s a website, app, print ad, or graphic—is created to serve a purpose. Good design, visual and verbal, tells a story that connects with the consumer on an emotional level, engaging the user and solving challenges. Purpose-built foundations for mission-critical operations. With unhindered access to and collaboration between the application and the infrastructure upon which it’s built, we can deliver the performance, reliability, security, and compliance that your digital environment requires. When the infrastructure is fine-tuned and configured specifically for the needs of your project, the results are superior. We have established relationships with key technology partners enabling us with the necessary resources to provide solid foundations. When your project launches, our partnership soars. From our very first conversation, throughout your entire relationship with us, we’ll work with you to develop creative solutions that address your specific business challenges—both the challenges you are currently working to overcome as well as any future challenges that are inevitable. Discover the Wield difference, and call us today!